Bare Knuckle Boxing – the future of combat sports? 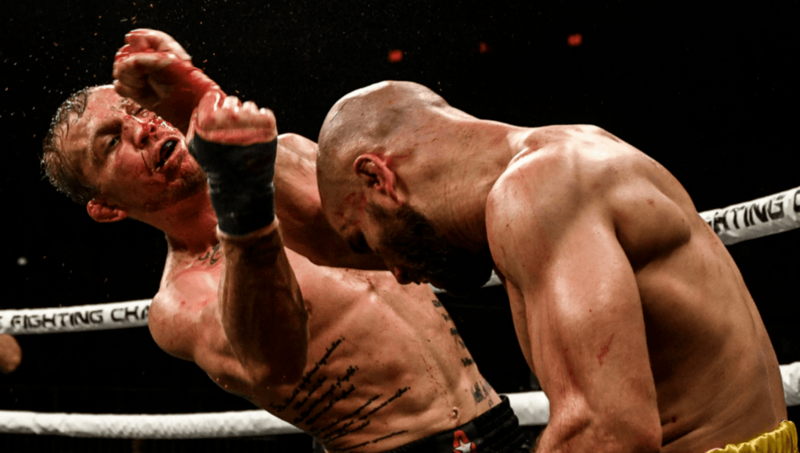 Bare Knuckle Boxing has arrived and certainly delivered on savageness as Artem Lobov and Jason Knight went to war. If you are unfamiliar, bare knuckle boxing is just as it sounds – two men boxing with no gloves (with slight wraps around the wrist and hand) for FIVE 2 minute rounds. For the most part, this has resulted in intense fights. There is no need to pace yourself with short rounds, and with no worry of take downs or clinching, most fighters are going hard right from the get go. The main event was no exception. Artem Lobov and Jason Knight, former UFC fighters, are well known for not shying away from a brawl. They didn’t disappoint – as the fighters attacked each other right away, dropping each other several times and doing serious facial damage in the opening round. At the end of the fight they looked like they each looked like they got hit by a bus. The two of them are no doubt warriors. Jason Knight taking a hard punch from Artem Lobov. Bare Knuckle Fighting Championships has certainly garnered a lot of attention this past weekend. With a fight between Paulie Malignaggi in the works against Artem Lobov (who both have beef after Paulie’s spat with Conor McGregor), there is certainly a good hype machine in the works. Is this the future of combat sports? At the moment, it seems to be the home of retired MMA fighters and boxers. There isn’t any full-time bare knuckle boxers that I know of, except the infamous Kimbo Slice – who would have been amazing at this format (RIP). So at the moment, it is a circus attraction. I think they are going to have problems growing beyond that, because of the image it naturally portrays. Lest we forget, MMA was once bare knuckle too when it was called No Holds Barred fighting (NHB). But once NHB started getting popular, enemies attacked from all sides and made the sport evolve into MMA, the more “respectable” form of fighting to mainstream viewers. I have no issues with bare knuckle boxing or NHB fighting for that matter. I enjoy the purism of the contest. However, there are reasons why gloves started being used. Primarily, to protect your hands from being broken. David “Tank” Abbott was the first to wear gloves in the UFC, being he was once the scariest puncher in the UFC (a seasoned street fighter), he knew the risks of punching bare handed. So I suspect bare knuckle boxers are going to suffer more hand injuries. Gloves also have the bonus of reducing the likelihood of cuts, so without them, a lot of more facial damage will occur (see photo above). Those two factors alone are going to affect a fighters health significantly. Furthermore, I don’t believe bare knuckle boxing will be “safer” in terms of brain trauma and CTE. The argument was that because the likelihood of breaking your hand hitting someone bare knuckle in the head increases, people may tend to pull back on the power to avoid hurting themselves (whether conscious or subconsciously). I’m not sure if that is valid though. In a training situation, sure. I know I rarely use gloves when hitting the bags or pads for that reason. I want to work on form more and making a proper fist and hitting with the proper area. As a result, I don’t throw punches as hard, because hitting a heavy bag bare knuckle full force (particularly a stiff bag) can hurt without proper strength and technique. But that is in training, where we are thinking and more methodical. In an actual fight, pain thresholds are way higher and often ignored. If you watched that fight with Artem and Knight, it’s pretty hard to imagine they were pulling back on their punches, lol. Those two are warriors, and I believe they didn’t think twice about any damage they were sustaining. So I think that particular argument for less brain damage on bare knuckle fighting is not a strong one. I could be wrong, but I would guess it is going to be similar if not worse than MMA. Why? It is using boxing 10 counts, which allows fighters to sustain multiple knock outs and continue fighting (which is one of the reasons MMA fares better than boxing for CTE). Plus, defense for bare knuckle boxing is even harder than MMA. The hands are moving faster (no gloves slowing them down, which might increase the power slightly), and less shielding – so people will be hit more. Plus, the rounds are 2 minutes long, meaning action is more intense with no ground or clinch work to slow the pace down. So the fights tend to be more intense fire fights. For these reasons, I believe it is going to be harder for this to grow beyond a spectacle. Serious athletes aren’t going to want to take the additional risk, especially if the pay outs are lower than top MMA or boxing promotions. Perhaps that can change if enough money gets pumped into it, but I wouldn’t bet on it. Whenever I discuss this with people at the gym, I always think about bare hands and no wrist wraps either. I think if this was the case and the rounds were a bit longer, it would prevent or at least mitigate some of the damage these fighters take.